Preoccupational Segregation Among First-Year College Students: An Application of the Duncan Dissimilarity Index. Annual earnings continue to be unequal across gender and racial lines. One reason for this disparity is occupational segregation, the overrepresentation of women and minorities in lower-paying jobs and occupations. This study involved an investigation of what could be considered the roots of subsequent occupational segregation among male and female minority and male and female non-minority first-year college students in relation to college major. 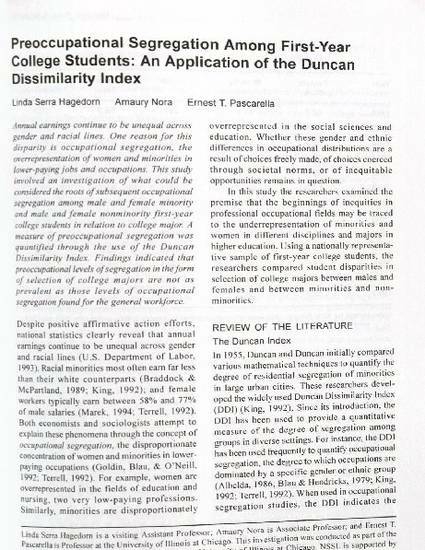 A measure of preoccupational segregation was quantified through the use of the Duncan Dissimilarity Index. Findings indicated that preoccupational levels of segregation in the form of selection of college majors are not as prevalent as those levels of occupational segregation found for the general workforce.